This is the removal of tissue within the pulp chamber of part of the vital pulp of a tooth. The pulp remaining in the canal(s) is then covered with a protective dressing or cement. This treatment is carried out if the pulp is exposed through decay or trauma. The exposed pulp is of larger area than a pulp cap can be carried out. There should ideally be hardly any pain associated with the tooth being treated, as its success depends on the rest of the nerve being alive. 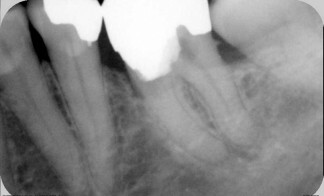 The chamber is a box-like space in teeth with multiple roots. The nerve that branches from the roots meet here. In single rooted teeth, this “chamber” would be the part of the pulp near the biting surface. The exposed pulp (nerve) must have blood supply, so therefore must be bleeding when exposed. If it isn’t then the rest of the pulp has become necrotic, i.e. the nerve and its tissue has started to breakdown and can no longer be preserved. It needs to be cleaned out and treated or remove the tooth. The chamber is cleaned out of the pulp tissue and on the bleeding, exposed branches of the nerve in the roots, a dressing or special cement is placed. This is to preserve the remaining part of the pulp in the roots. Effectively everything above the dressing is no longer alive. There is no guarantee that the remaining nerves in the roots will survive the procedure. The pulp has the ability to make more tooth structure to protect itself, or to cope with any extra stresses with biting that the tooth finds itself in overtime. Once the tissue is lost that part of the tooth is more brittle, and it does not sense hot or cold. It is not an ideal situation. This treatment is often carried out if the there is a time constraint to completing a proper root canal treatment. The patient is, financially or otherwise, not ready for a root canal treatment, or removal of the tooth may not be ideal, usually, for medical reasons. However, this can be successful and many teeth have survived this partial treatment of the nerve. The warning is that the nerve can still die in these teeth often without any symptoms. The tooth should be protected by a filling to prevent the tooth breaking as these cracks tend to occur at the level of the dressing. Let’s face it is a compromised tooth and it should treated that way. It should be monitored regularly for changes, such as cracks or infections.